We got a Big Frickin’ Trap (BFT for short) and put some peanut butter on it. That seemed to work better than the sticky traps (which are all still empty) and the poison (which hasn’t been eaten). I even took a picture of it, just for posterity. 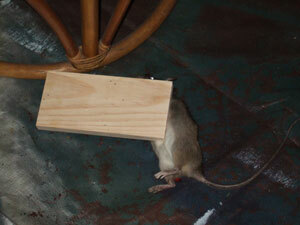 Not to worry, the rat is partially obscured since the trap flipped over on top of it. The impressive thing is that he still managed to lick every last bit of the peanut butter off the trap. That’s determination. We could learn a lot from that rat. I guess in his own way, he won. For a creepier explination what if this rat triggered the trap, died, and then his little friends ate all the peanut butter from around his dead body? Rat #1: You go first. Rat #1: Okay, I’ll tell you what. You go first for this one, and next time I’ll go first. Naw. If there were more than one rat you would have only found rat bones left in the trap. The peanut butter would have been only the appetizer. By the way, you gonna mount it?